This past weekend, I traveled down to Houston and had the pleasure of hanging out with some good friends at theÂ inauguralÂ Carbine Home DefenseÂ class byÂ 2 Vets Arms. In planning for the weekend, I had two main goals in mind. Goal #1 was to train with and gain some great insight from the folks at 2 Vets Arms. Goal #2 was to have an opportunity to run one of my newer gear purchases through some solid outside work in the tough South Texas heat and humidity. That piece of gear is the Haley Strategic D3CR (Disruptive Environment Chest Rig). 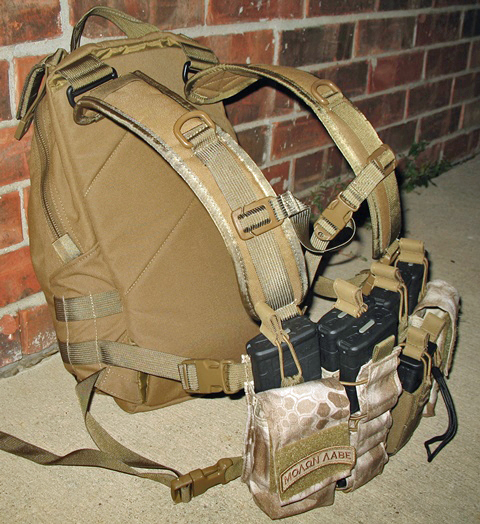 Haley Strategic is well known throughout the firearms community for their training programs and the chest rig is their newest item as they expand their product development offerings. 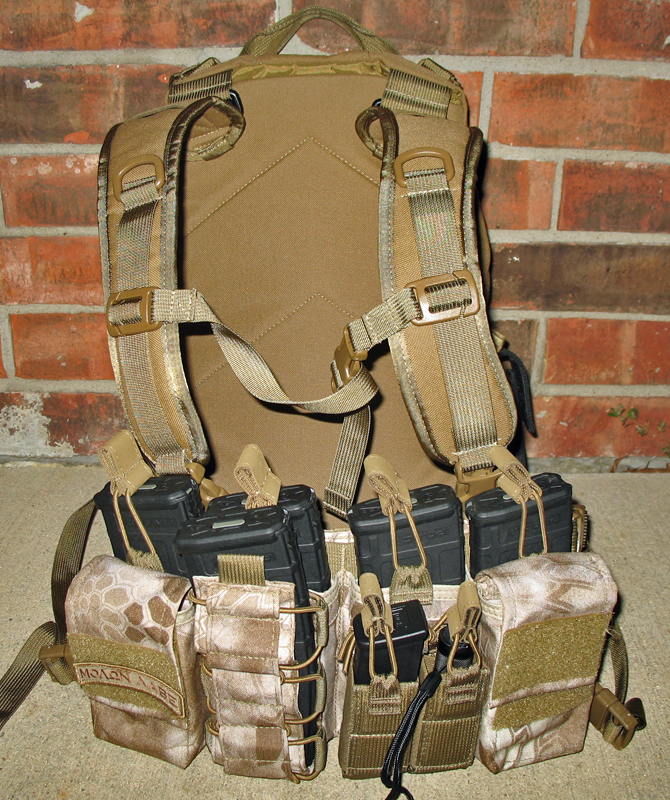 The D3CR is designed to be a low-profile and flexible platform which can be used as a stand-alone chest rig when using the supplied H-harness or you can remove the harness and secure it to a plate carrier or other armor using a quick release clip system. You can also remove the panel on the backside of the rig to expose a full area of Velcro which can help secure it to your armor option if it has that capability. 4 pouches for rifle mags (AR or AK) single stacked and aligned side by side, the mags are held in place by Hypalon retention tabs. Most basic configurations I’ve seen people running have been 4 mags, 1 pistol mag, a multi-tool, a bleeder kit and a handheld GPS unit, but as you see from the picture below, if you needed to run a really heavy configuration, you can get 7 mags and 2 pistol mags in the rig (shown below with seven 30 round PMAGs and two 13-round Glock 21 .45 ACP mags). I’m not a big fan ofÂ putting rifle mags in the general purpose pouches as they are not very secure (the flap canâ€™t be pulled over them) but in a serious situation where having 2 extra mags would be critical, itâ€™s an option to be considered. A couple items of note, Brandon has the G-Code INCOGÂ holster (which was developed jointlyÂ with HSP) and we were able to verify that the INCOG does fit in the general purpose pouch so an individual could have their Glock placed on the rig. 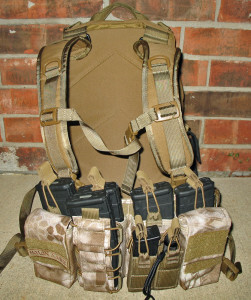 Also if you have a pack with clips like the Tactical Tailor Removable Operator Pack, you can remove the harness from the D3 and mount it directly to the pack using the clips on the pack and no additional hardware. Since I own that particular TT pack, this was a big selling point for me as you can quickly have a chest rig and operator pack combo. The D3CR is made from 500 Denier nylon and a big plus for this rig is that itâ€™s made right here in the U.S. It is available in 7 different colors: Black, Coyote, Multicam and 4 Kryptek patterns Nomad (shown), Highlander, Mandrake and Typhon. The first thing I noticed about the D3 was how comfortable it was. Iâ€™m 6â€™0 and 235 and there was still plenty of slack available in the lower harness strap after I got the right fit. The harness straps are supportive but flexible and that is a good thing as the hours of wearing it pass on. The D3 does a nice job of holding the load close to my body and I haven’t had a problem with it sagging or moving. The D3 design really makes sense when you get into a prone position, kneeling, or movements other than just standing up straight. Unlike other chest rigs which have double stacked rifle mags and then pistol mag areas on top of it, the single stack rifle pouch design provides superior mobility in my opinion and is more comfortable, while not making you feel like you are sacrificing anything. I didn’t wear gloves during the training and the Hypalon retention tabs were easy to use and manipulate on and off the mags, even after have my hands were sweaty and dirty. In fact, I found it to be very comfortable after wearing it multiple hours with a full load during training in ~90 degree South Texas heat and high humidity. The D3 build quality is excellent. All the parts including the harness, clips, pouches, Velcro, and stitching are top-notch and appear to be of a level that will serve the user well for a long time. Please note that this is an initial review and Iâ€™m looking forward to running this rig through more training and other work and seeing how it holds up over time. If there are items to report, Iâ€™ll post a follow up. The D3 is available through the Haley Strategic website and the price is $170 + shipping. Everyone has their own opinion when it comes to value but for me, this is a fair price for a platform with this level of comfort, flexibility and overall quality. Iâ€™m not a person that is an impulse buyer and is easily drawn in by fads, or someone who has to have a product because [insert super cool/famous name here] has endorsed, designed, or attached their name to it for whatever reason. I like to take my time, do my research and make an informed decision. That being said, I spent a fair amount of time debating on whether to buy the D3 and it did not disappoint on any level. If you’re in the market for chest rig, definitely give the D3 a look. I love the modularity of this rig. I’ve been eyeing it for a couple months. Aside from the appeal of your shown set up it looks like I could potentially wear it in a battle belt config. I’m about your same size, would this thing be monstrous on the waist? Am I crazy? Especially if I’m planning on running just 4 mags plus 2 pistol mags, and small items in the gp pouches. Haha! You’re not crazy, it’s a logical question to ask. Could you do it, yes. Would you want to do it, probably not. You would be hurting yourself from a mobility standpoint. If you are looking at a battle belt option, there are much better choices out there. Thanks, I still want this chest rig bad. Nice review Matt. I’ve had my eye on these since they came out…I think it’s time to pull the trigger. Thanks for the review. I wanted to get more review for the D3 before I pull the trigger. Curious how you installed it to the TT, because I have the Modular Pack version. If somehow, you could add more pictures on how you have these two together, would gladly appreciate. Either you post it here, or on FB, I subscribe to both. OK not to sound stupid..I tried a Banshee plate carrier and I hated it. I know this is 100% different. (just telling you my limited exp). Say I want to get this and attach it to the TT Removable Operator pack you linked to ..How do I get it set up. Honestly I want to train and go to classes but dont want to have my stuff all screwed up . You attach it to the TT pack with just a couple buckles. You won’t want to run through a training course like that though, you’ll just want to run it with the H-harness. Much more comfortable. Thanks for the reply , ordering both on payday friday .. Your site is fantastic ..Glad I found it ..1 Day I hope my site can be as great as yours..
@Rick, can you be more specific on why you didn’t like it on the Banshee? I saw someone on YouTube on how to attach it to a TAG Banshee, but, no review on the PROS & CONS with this specific PC. I’m on the fence about trading/selling my TAG Banshee to for a Mayflower LPAC. Thanks for your reply. Thanks Rick. I’ve been driving to and from work with the TAG Banshee because, some folks have mentioned that the rear has a nagging issue, where your back muscles doesn’t get to relax, and I can see it now. For now, I only have a Velocity LEVEL III/IV ICW + soft armor on the front, and it does pull the rear up, and it digs in, making your lower back muscle tense up during the ride. My interest with the D3CR is that it takes the role of mag pouch and GP pouch since I don’t have my IFAK yet, can’t decide, so hopefully the D3CR will decide for me. I placed my order since Matt did an awesome review and just couldn’t wait for another review, specially with the integration to the Tactical Tailor. Hoping to take my Modular Pack up on a hike again, maybe this time, have my Banshee “outside” the pack. Just have to warn the Park Rangers, that I’m trying to do a “research and review” of these products. Stay safe everyone. Thanks for the review. Quick question…are any of the pouches (GP, Stuff-It, etc.) removable? Also, on the rifle mag pouches is there any retention beyond the bungee? I ask because I run Magpul Ranger Plates on my magazines and the bungee retainers always slide off of those. Would it be possible to know whats the biggest magazine that would fit the pouches in terms of measurements (inches/milimetres)? last question …Did you have to get any extra straps or did you just use what came with the chest rig and backpack ? Just the standard pieces on the rig and TT. Nothing additional needed.